”Are there only 49 seats available at 49 Seats?” My friend asked. That’s true when they first started out at the first outlet at Blk 49 Kreta Ayer Road. 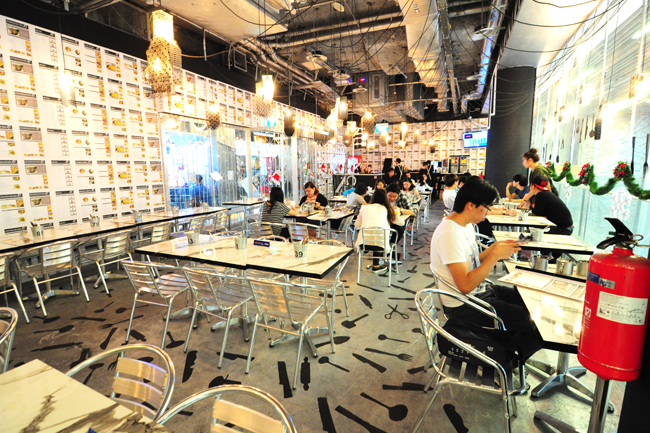 49 Seats had since expanded beyond 49 seating capacity for their 1st outlet and moved on to their 2nd one at Orchard Central, catering to the lunch and dinner crowd in the Orchard area. The first impression when I stepped into 49 Seats was the huge metal front door that reminded me of a huge safety box. I wondered if there were any treasures inside. After all, good food is always one of my most valuable assets. Most of the furniture inside 49 Seats were made of metal, including the utensils and mugs. I felt like I was living in the Iron Age. Perhaps some heavy metal music would complete the picture? Just kidding, I preferred to eat my food in peace. The selection of dishes includes fish, chicken or beef for the main course, pasta (10.90 – $14.90), light bites ($4.90 – $9.90), sandwiches ($9.90 – $10.90) and sides ($5.90 – $13.90). 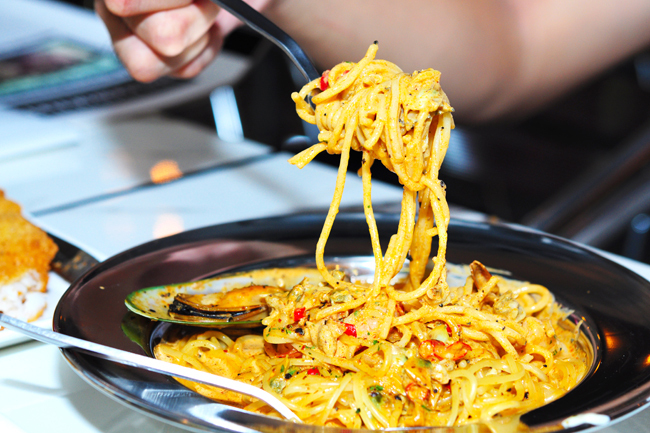 A quick look around our neighbouring tables would probably reveal the clear popular choice – Tom Yum Seafood Pasta ($14.90). The smart fusion of Thai tom yum with Western pasta was refreshing. The nice balance of sour and spiciness stimulates our appetite. The chilli padi added gave it an extra fiery punch and my friend was mumbling “Shiok ah” throughout the entire dish. 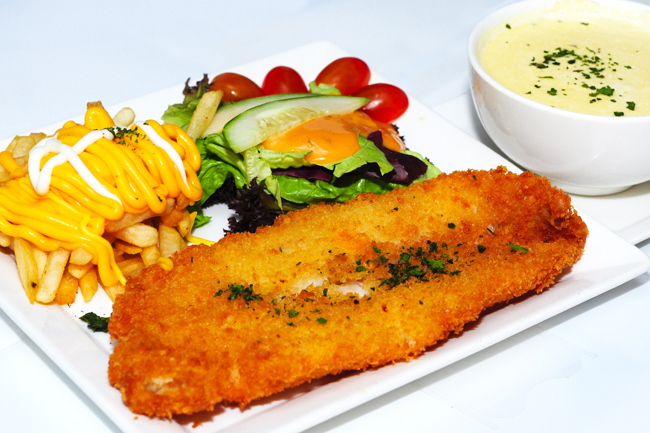 The Fish & Chips with Al Scampi Sauce ($16.90) came with a golden brown crust with the Al Scampi Sauce in a large bowl. I heard slurping sound coming from the table next to mine, and saw that the lady beside me was actually drinking the Al Scampi Sauce directly from the bowl. She must have thought that it was a bowl of soup instead. We loved the Al Scampi Sauce. 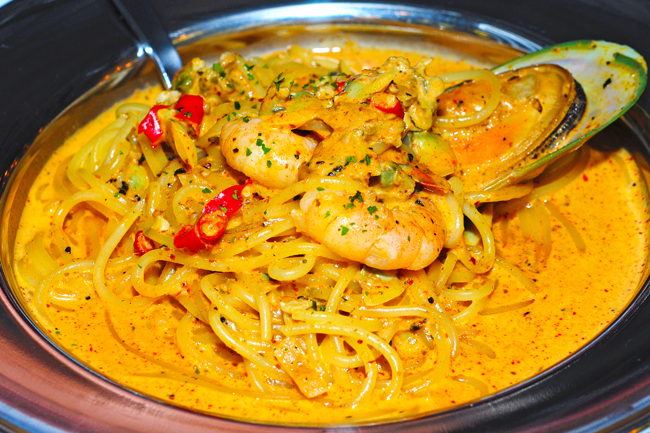 A light and not cloyingly thick and creamy texture with an assortment of prawns, mussels and clams. A brilliant twist to the usual mayo or tartar sauce. 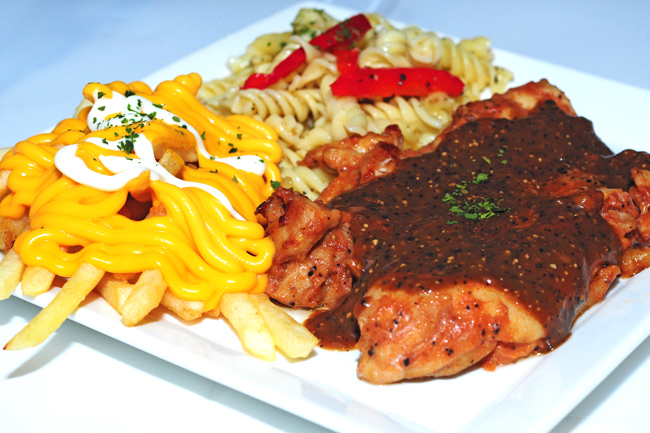 The Chicken Chop with Black Pepper Sauce ($13.90) that came with 2 side dishes was tender and succulent. Pretty decent but not as unique as the Tom Yum Seafood Pasta and Al Scampi Sauce. The Pasta Salad that we chose for our sides was slightly salty, perhaps a little fine tuning would be good. The fusion dishes were indeed refreshing and delightful. After all, we are always on the lookout for unique food. The addition of 49 Seats in the Orchard area has provided shoppers with an addition dining choice. Don’t worry, there are more than 49 seats to cater to large group gatherings.